Every month one member of the Carus team introduces his/her favorite work, whether it be a choral piece, a CD, a songbook or an organ edition. February 2016's contribution comes from Martyna Grobelna. 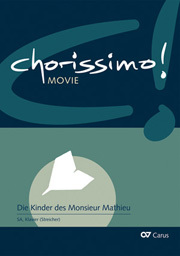 The film “Les Choristes” (released in Germany under the title Die Kinder des Monsieur Mathieu) was one of the most successful French films of recent years, thanks in particular to the wonderful music of Bruno Coulais, who won a César in 2005 and was even nominated for an Oscar. It is not insignificant that the director of the film, Christophe Barratier, himself sang in a boys' choir as a young boy and later studied guitar at the Paris Conservatoire. As many other viewers, I was deeply moved back in 2004 by this multi prizewinning film music. Carus, too, made a small contribution to this story, releasing a CD with songs from the film and other songs for children's choir. The film “Les Choristes” is about the fate of the teacher Clément Mathieu, who works in a country boarding school for difficult boys, and through choral singing is able to communicate the courage to face life. The boys, who have gone off the rails, find true friends in the choir, forget their everyday worries and ultimately become a well-functioning community in which each person has a distinct role to fulfil. 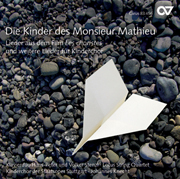 Songs such as “Vois sur ton chemin – Sieh auf deinem Weg” or “Caresse sur l'océan – Sanft weht ein Hauch überm Meer” give the children the hope of a better life in which they feel safe and secure, and can look to the future positively. I recommend this CD to anyone who wants to experience the healing power of music, as well as to music teachers and choral directors who try every day to communicate through music, and in particular through singing, the most important values and joys of life. 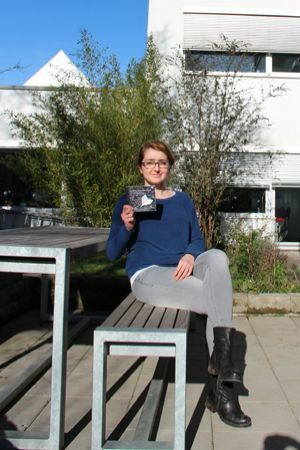 Martyna Grobelna has worked in the Production Department since November 2013.